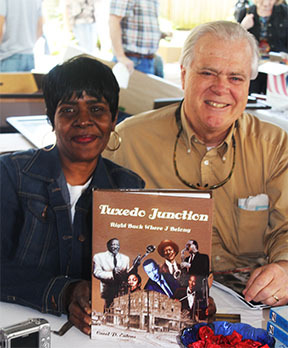 The name Tuxedo Junction is well known in the city of Birmingham, Alabama. It was a ballroom on the second floor of the now Nixon Building in the early 20th century, it is a ommunity in Birmingham’s suburbs of Ensley and it is a melody co-written by Erskine Hawkins in 1939 that put Birmingham on the map around around the world. The songs, the music, the dancers, and the singers are what Tuxedo Junction should be known for. That is what the book “Tuxedo Junction: Right Back Where I Belong” is about… the music. Everyone knows of Erskine Hawkins – sort of. He played the trumpet and he co-wrote Tuxedo Junction. But who were Erskine Hawkins and Joe Britton? Where does J. L. Lowe and Calvin Ivory fit into this conglomeration of musicians? They are known as band directors and educators around the state, but they were more than that. They made their names during the Big Band/Swing Era when they had their own orchestras and played with some of the great orchestra leaders of the day like Duke Ellington, Louis Armstrong and Cab Calloway; and all of these men and women were taught and nurtured by an humble, but stern, printing instructor at Birmingham’s Industrial High School, John T. “Fess” Whatley. That is what the book “Tuxedo Junction: Right Back Where I Belong” is about… the musicians. It tells how music took some of those musicians out of the coal mines of Pratt City, the steel mills of Ensley and the wire plants of Fairfield to become some of the greatest entertainers in the world; of the determination of families, a printing instructor’s tenacity and the God given talent that propelled those entertainers to heights they only dreamed of. That is why “Just A Little Bit of History” has been included so you will see what is meant. That is what the book”Tuxedo Junction: Right Back Where I Belong” is about… the times. Carol self-published the first edition hardback of this remarkable book about the roots of Jazz in the lively city of Birmingham from its start in the 1920s through its hey-days in the 1950s. Along the way she also discusses the earlier history of Birmingham and its surrounding towns through the eyes of the African-Americans that built the Steel City, The Pittsburgh of the South. Carol and The Ardent Writer Press saw the need to bring this story to younger generations who may not appreciate the rich and often forgotten history of the music of the past. The second edition will be out in the summer. For the future Carol has other projects to develop about the musical giants of her home state and city that time has forgotten, but history will not. The Ardent Writer Press is pleased to have Carol with us. Her skill as a writer (and a web designer and as a book designer since she did both on her own!) is remarkable. And more importantly, she understands the music. She’s been there. 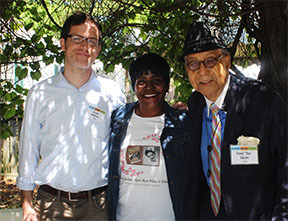 And along the way developed some close friendships with the people who made Jazz happen in Alabama, like beloved jazz great, Frank “Doc” Adams. Doc recently stepped out on his own as an author with his collaboration with Burgin Mathews of Birmingham on his autobiography, Doc – The Story of a Birmingham Jazz Man. Carol’s first edition is available for sale on her website, www.tuxedojunctionbook.com. Check it out. The link is on the right sidebar. www.tuxedojunctionbook.com ON SALE NOW! HERE. The Alabama Jazz Hall of Fame is at www.jazzhall.com. On the day of her signing with Ardent Writer Press at the Alabama Book Festival in Montgomery on April 20, 2013 Carol introduced publisher Steve Gierhart to Doc Adams and his co-author, Burgin Mathews. Both Carol and Steve watched as Doc presented his autobiography to the public with Burgin and listened as Doc played a few compositions for the public. 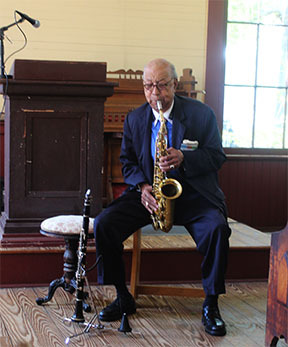 Doc is an inaugural member of the Alabama Jazz Hall of Fame. The link to the Hall of Fame where Doc is also a professor emeritus is above. Photos of the 2013 Alabama Book Festival and Carol are below. Frank “Doc” Adams, Alabama Jazz Great, plays for the audience at the Alabama Book Festival.